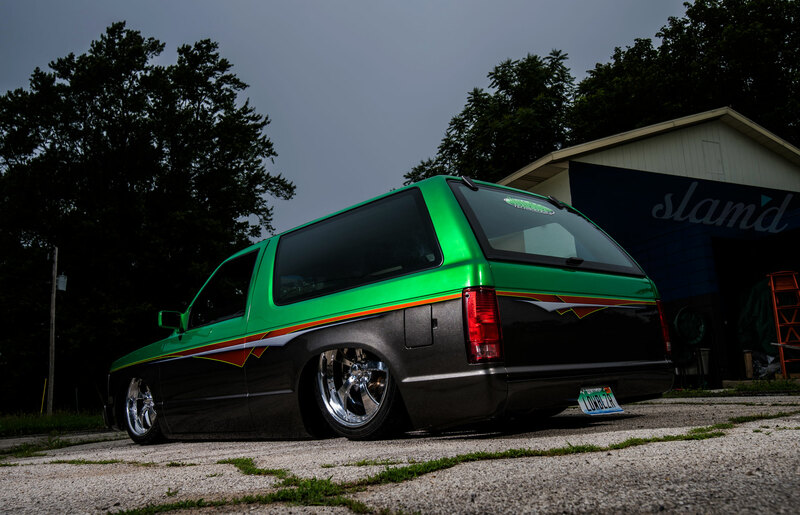 If there’s one thing the Slam’d crew values more than than a lack of ground clearance, it’s family. Thats why the story of brothers Chad Sperry and Cory Schiller is such a special one. There is nothing quite like the bonds of blood being combined with a shared love for all things low. 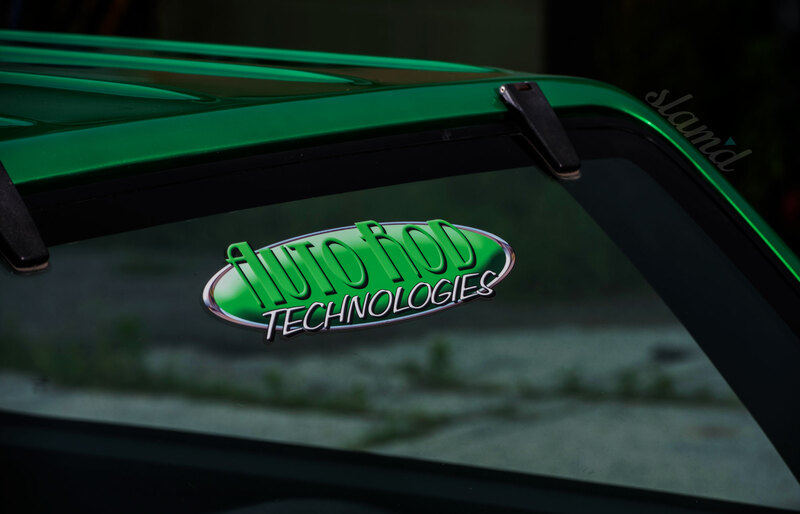 Chad Sperry is the owner and operator of Chad’s Paint & Audio, which also conducts business as Auto Rod Technologies. 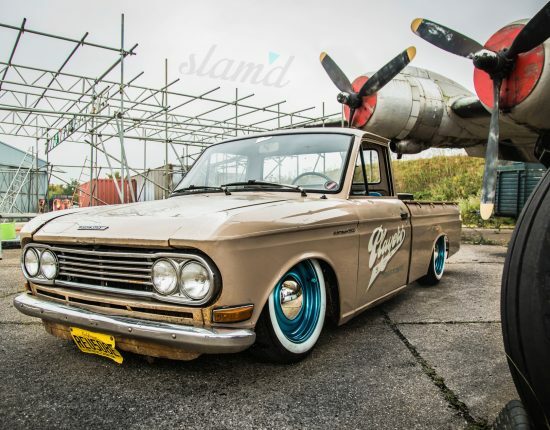 Cory (Chad’s half brother) has worked in the shop since his early teen years and the two of them have dedicated their time and resources to building some seriously fantastic examples of Slam’d approved rides. 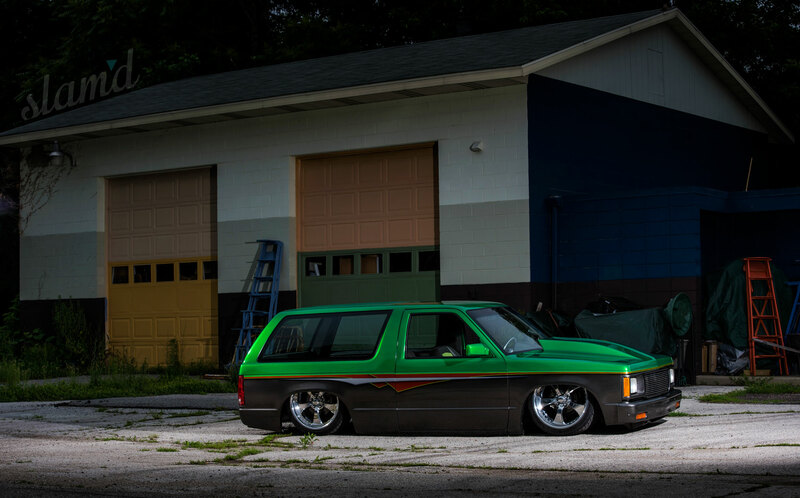 Beginning with Big Brother, Chad Sperry’s daily driver is the perfect blend of OEM beauty, quality customization, and niche exclusivity. Viper powered Rams are plenty rare in their own right, however finding one of the elusive serpents equipped with air’d out suspension is nigh impossible. Chad’s hunt began with a simple search for a sporty toy hauler. 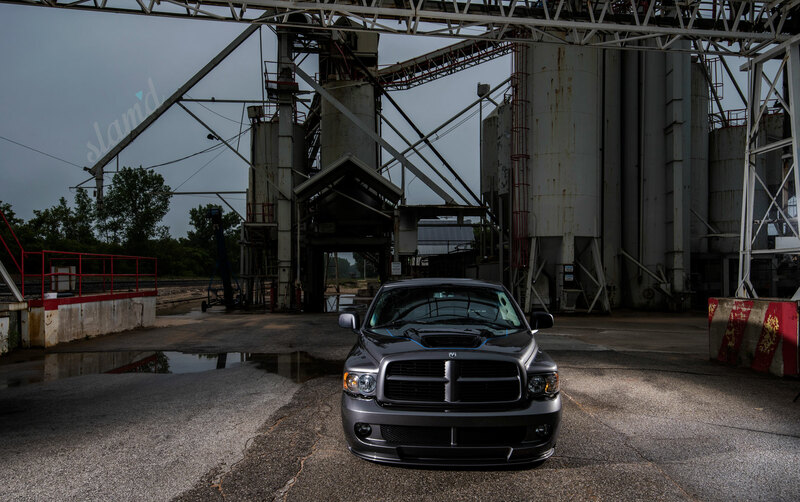 His taste led him to look for a late model R/T Ram, however after finding an attractively priced SRT version, he was compelled to look a little closer. Well look a little closer he did, and after nearly four hours of time spent hoisted in the air and tested on the road, Chad was reasonably satisfied with the used condition and pulled the trigger. 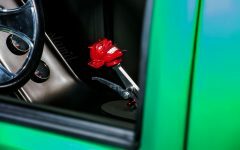 Despite his initial commitment to leave his new-to-him SRT untouched, it took hardly any time at all to sway his mind in favor of tasteful modification. 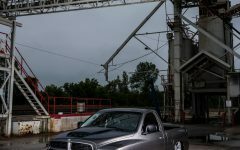 The truck had been previously lowered to static conditions, however it was not done in a proper fashion nor up to Chad’s standards. Apparently the suspension set up was not conducive to absorbing bumps any deeper than the thickness of a pop-tart, according to Chad’s expert estimation. In addition, the paint was less than up to par for a professional painter’s ride, so a full build seemed imminent. Chad’s plans to complete his exotic, yet practical daily, were strictly confined to a three month build timeline. All things considered, the extra month that reality insisted on spending to complete the projects was completely reasonable, all things considered. The uniqueness of the SRT-10 model Ram came with its own set of equally unique challenges and obstacles. The largest of these perhaps, was finding parts suited to handle the torque generated by the monstrous Mopar block. Everything is sized XL from the factory and everything is heavy duty as-is. This meant a whole lot of special orders and custom machine work to create a better-than-factory experience for Chad’s beast. The build order for the Ram was more of a build blur, as everything was tackled all at once in order to appease the narrow window of time allotted on a personal project. A full teardown was completed in just one long day, blowing the entire truck apart in the shop. Each and every body panel was completely stripped to bare metal, removing any memories of the unworthy paint job. 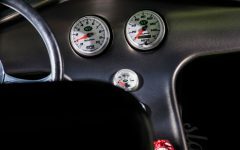 In order to rectify the improperly modified suspension, Chad chose door number three which meant a fully custom air suspension set up. While the old paint was removed, so too was the wobbly suspension. The suspension re-do began with a complete custom front setup from Michigan Metal Works. Ultimately both the front and rear track widths were narrowed a full two inches at each corner in order to tuck the torque quelling rubber. The rear suspension was set up with a parallel 4-link, using Watts link and lift bars with ‘bag on bar setup. 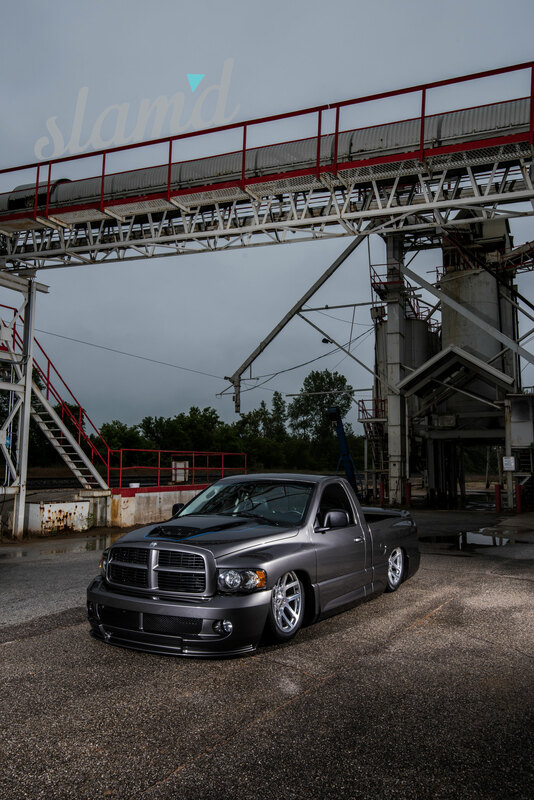 All of the extensive custom work done to create a durable and safe suspension set up was well worth the effort and allows for Chad’s truck to lay frame as well as ride comfortably, even in such a performance-minded machine. 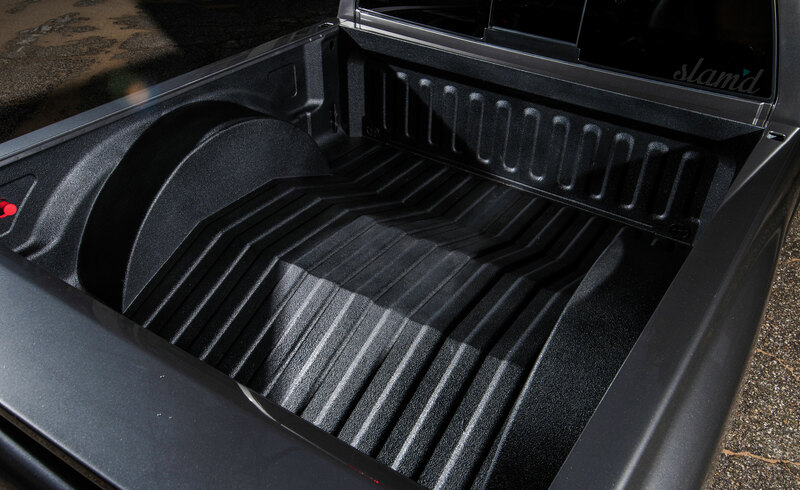 Air Lift Performance Dominator ‘bags sit at each corner, providing the proper adjustability to keep the truck afloat. 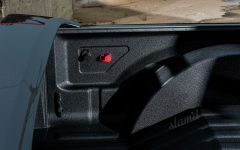 An 8-gallon tank, dual Viair 480s, and AccuAir control system all sit cleanly tucked under the custom raised bed floor. 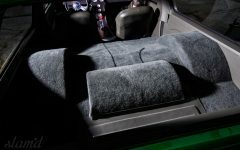 The custom bed is fully functional and durable as the truck certainly fulfills its intended purpose in carrying Chad’s dirt bikes to and from the track. Underneath the bed sits a notched frame to accommodate the oversized SRT rearend and custom machined axle shafts sending power out to the meaty tread. Underneath the hood lies not just the heart of the beast, but the trucks’ soul, captured in the 10 cylinders of venomous engine. 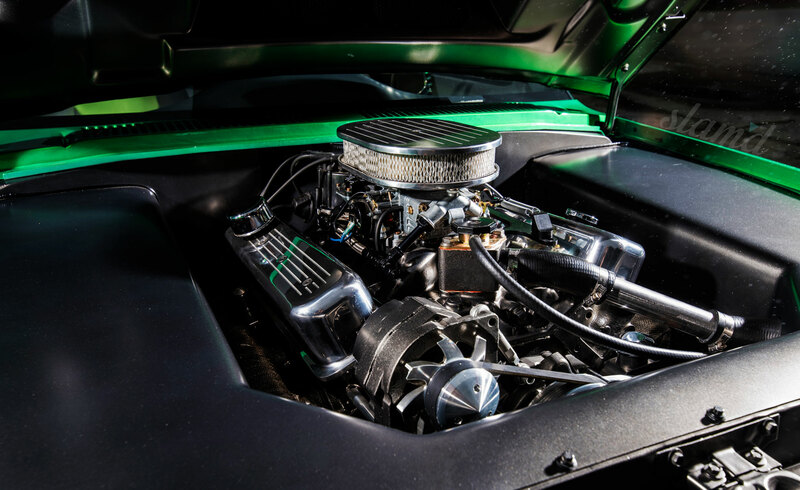 To properly adorn this unique power plant, Chad set out to clean and customize the engine bay. 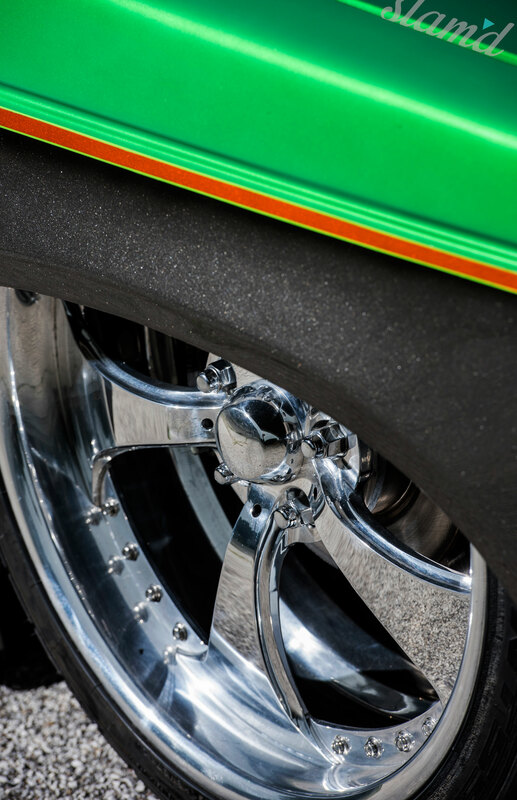 Adamantly opposed to the idea of exposed tires, custom inner fenders were a must. 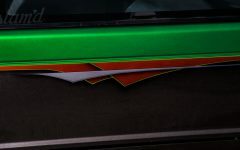 However, Chad was equally uninterested in building beautiful fenders that would eventually display the dents and dings supplied by bouncing road debris. 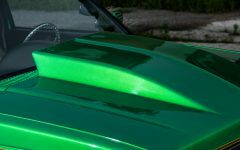 This led him to pursue designing and fabricating a double layered fender system; an inner that would provide all needed protection against the elements and an outer the would adequately adorn the customized engine bay. This decision also allowed for a large amount of hardware to be cleanly tucked between the two fenders. The AC lines, ECU, ABS lines, and fuse box were all located between the layered wheel wells. The fuse box included an extra panel for easy access. 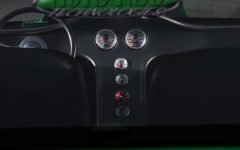 The ABS controller was mounted to the inner side of the truck’s frame. 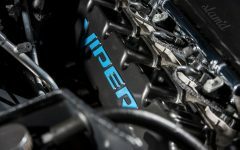 Finally the valve covers of the beast were painted in black with electric blue lettering, helping the Viper moniker to jump out at gleeful admirers. The painter’s truck, after being fully stripped to the original metal, was sprayed down with Southern Polyurethanes epoxy coating. Obsessive compulsive body work ensued the straightness and ripple free surface when. The body work was done with mindset of preserving the factory beauty and sleeper attitude of the SRT-10, which meant limiting the shaving process to the antenna. All the handles and the fuel door were left intact. Post body work the truck was again sprayed with SPI’s 2K Primer. The primer was completely sanded and covered in a custom mixed color of Pro-Spray, and topped with four coats of SPI’s clear coat. Finally the entire body was block sanded and buffed for a final finish. 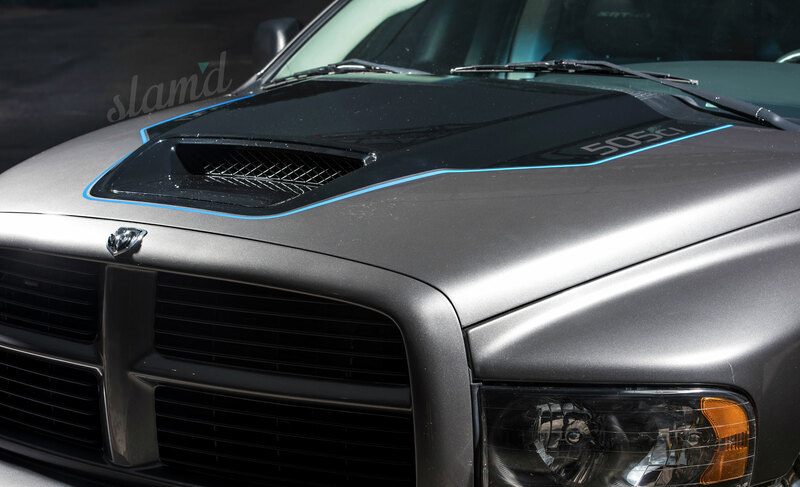 The truck’s hood was panted with the two tone graphics style, and the black section outlined in an electric blue, matching the valve cover lettering. 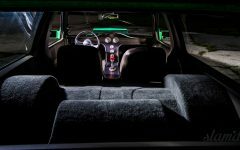 The SRT interior was left almost completely stock, with its high-quality leather embroidered bucket seats, clean gauges, and aggressive six speed shifter. 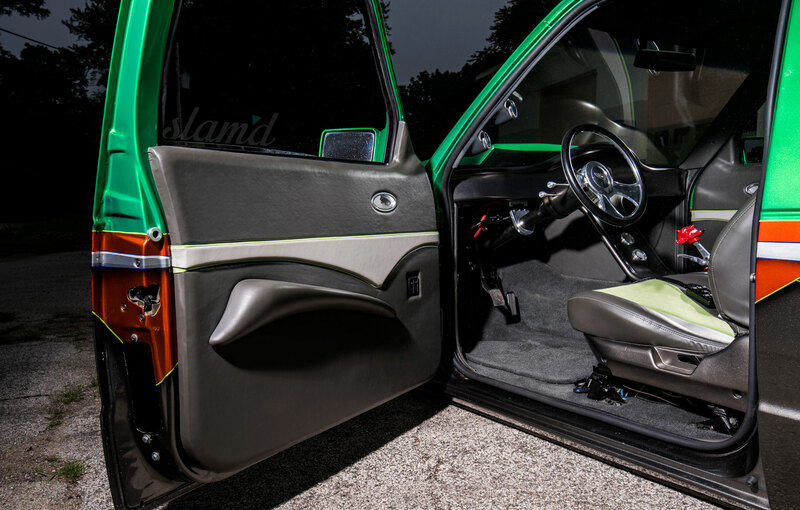 The interior upgrades were purposely limited to custom embroidered floor mats displaying Chad’s shop logo, a Kenwood DVD/Navigation head unit, hidden 10-inch RE Subs and Amps, and the dash molded air controller. The subtle yet highly custom build makes for a gorgeous, ultra clean, daily driving, toy hauling, and occasional track competing monster. 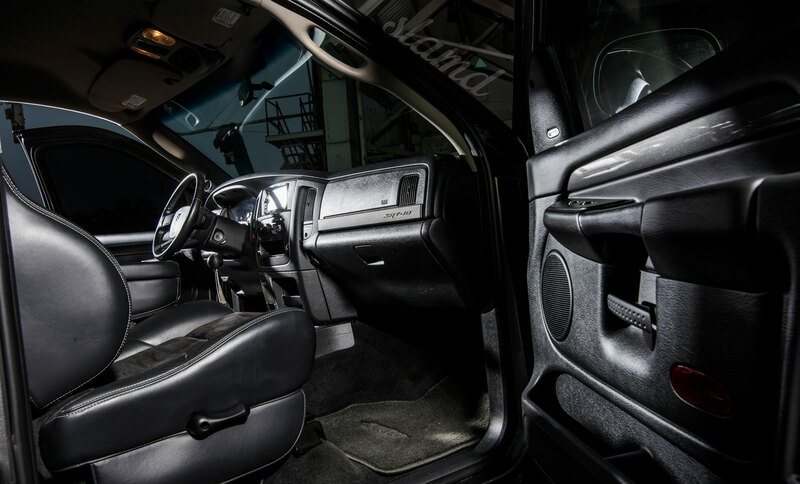 The truck’s finish is understated and timeless. 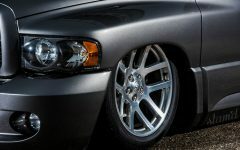 It makes use of the excellently styled and equally practical SRT 22-inch OE wheels. It subtly matches the under-hood customization and exterior color scheme. Most importantly however, the truck completely satisfies its builder/owner. What started out as an under-built pile of potential, has turned into the show stopping and ultra comfortable gem that Chad envisioned. 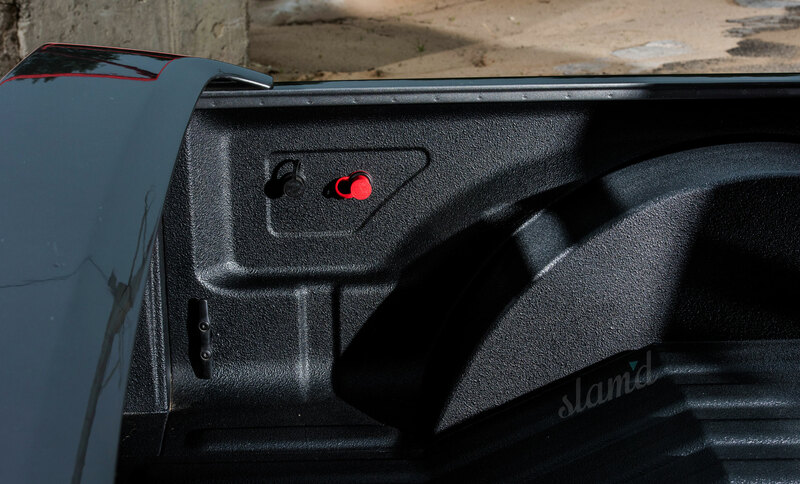 Building, driving, and doing what you love is everything that Slam’d is about. 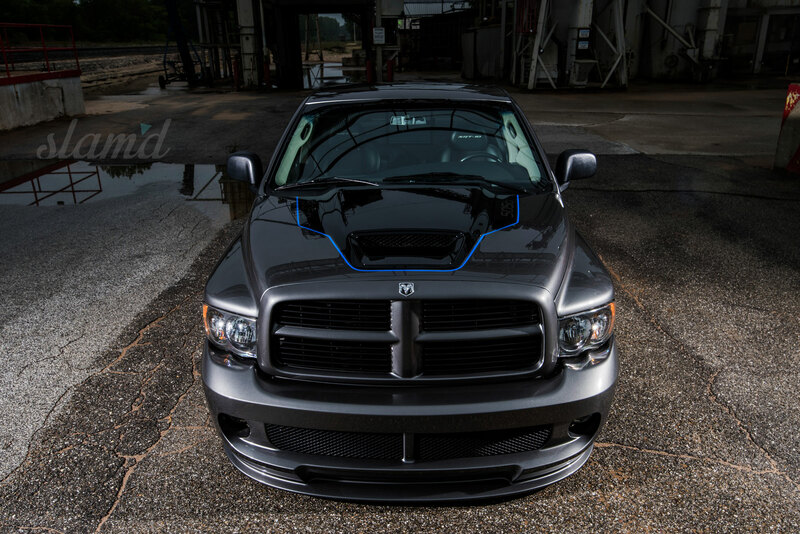 The fact that Chad took Mr. Sinatra’s legendary advice and did it his way, makes this SRT-10 another perfect addition to #teamslamd! Special Thanks: To my parents for providing me with their home garage to help get this business started nearly 20 years ago and to help instill a strong work ethic at a young age. The guys in the shop, Justin Joseph, and Dave Loraff for helping to get this thing back on the streets in such a short time frame, Cody Wiggs for taking a few months off his regular job to help get this project knocked out. And especially Kate Beck for not being the typical girlfriend, and for pushing me to build everything that we build (her Hudson Hornet is coming soon). Moving on to the other half of this Brotherly-Duo; Cory’s build is one of almost completely opposite roots, with elements that seem more at home in a fairy tale than anywhere else. There is something to be said about the magic of love at first sight. Equally romantic is the idea of having a picture perfect match somewhere in the world, waiting to be found. However, residing on the other side of the spectrum is the classic tail of the beauty living right next door. Its along these same lines of reasoning that humans have determined grass to always grow more greenly on the opposing side of the fence. However, sage men of wisdom and those who have chased to the point of exhaustion alike have come to the conclusion, that when viewed rightly and cared for properly the grass under their own feet would be as green as any grass could be. The perfect match and object of unparalleled beauty is often waiting right under our noses, simply in need of our dedication, before being made to shine. So too goes the story of Cory Schiller and his ’85 S10 Blazer. 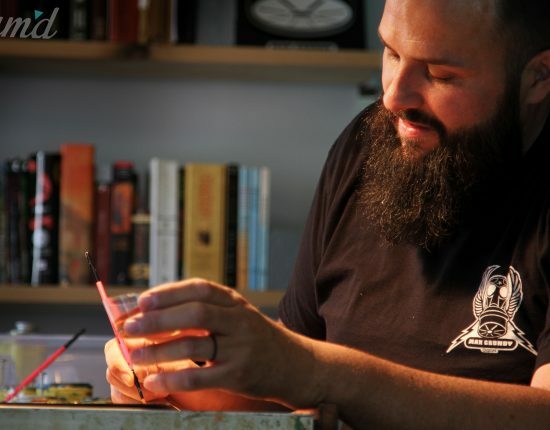 Cory’s fascination with customs began in his early years, around the age of 13. It was at this time that he began to work in his older brother’s body and paint shop. 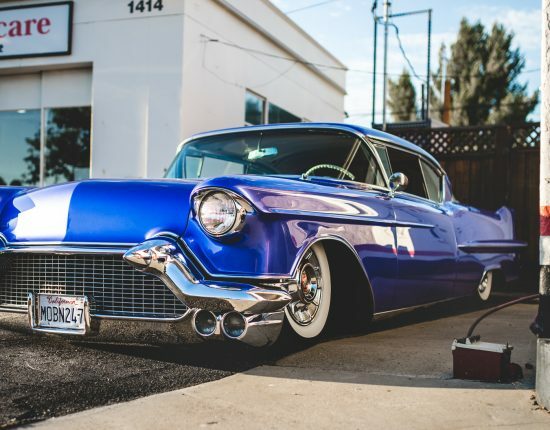 Steadily building traction in his repertoire of shop skills as well as his love for customs, Cory set his heart on the building of a traditional Street Rod. 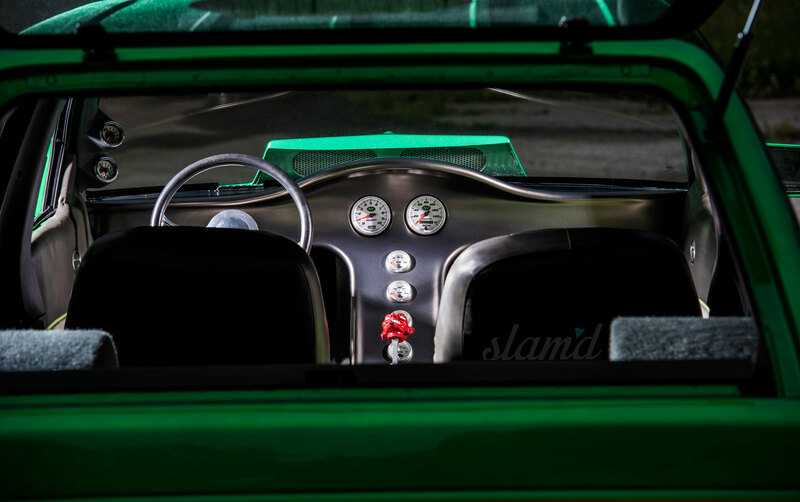 His sights zeroed in on the Street Rod genre about two years after first going to work for his brother. 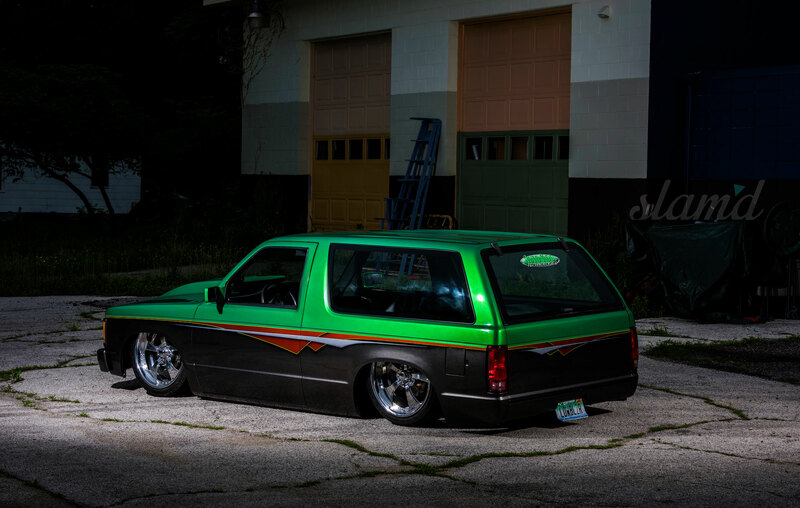 Cory already owned his Blazer and had humble plans of fresh paint and daily driver comforts, to suffice his needs while searching for a Street Rod platform in his budget. 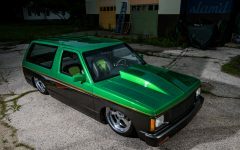 He continued the hunt for some time and after being unable to find a good match, whimsically altered course with a 1977 C10. The C10 as it turned out was a bit more of a restoration than he had intended to bite off, including plenty of rust to address. Ditching the distraction, Cory made the very fortunate decision to turn an eye back to the beauty next door, and focused all his creative plans on his Blazer. His first step towards full Blazer beauty was taking his paint plans for the tired C10, and adapting them to the S10 Blazer build. 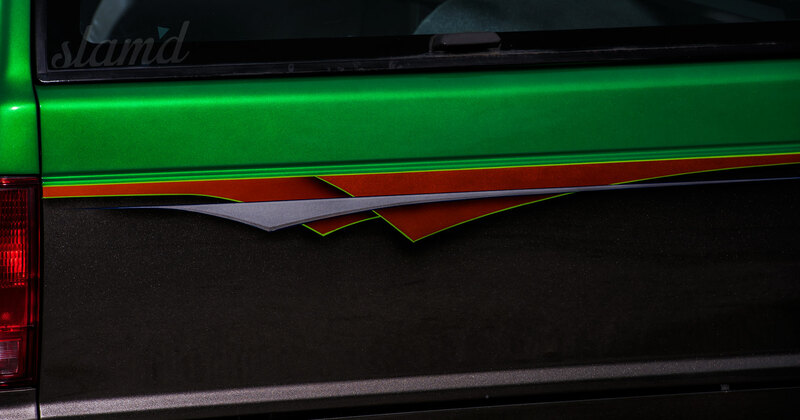 The S10’s poisonous green is achieved by using SEM Mint Green Candy, sprayed over a proper coating of Pro-Spray custom mixed silver. The highlight graphics are SEM Orange Candy over Pro-Spray custom silver and gold mixture. The bottom half of the Blazer is finished in House of Kolor Galaxy grey with a complete SPI clear coat. All of the frame, suspension, and components are also painted in Galaxy Grey and topped with a matte SPI clear. Helping to display the highly excellent paint and body work are shaved handles, locks, emblems, antenna, windshield wipers, and body seams. The exterior’s finishing touches come by way of a billet grille, paint matched sport mirrors, and a Grant Kustoms roll pan. 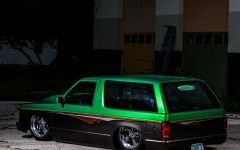 Never having intended to go all out on his Blazer build, Cory first began with the custom paint and then moved onto the suspension, interior, and powertrain. Right around the same time as gutting the interior, Cory was bitten with the show bug. He began to take the beautifully painted body to local shows, while searching for a new heart to power his build. 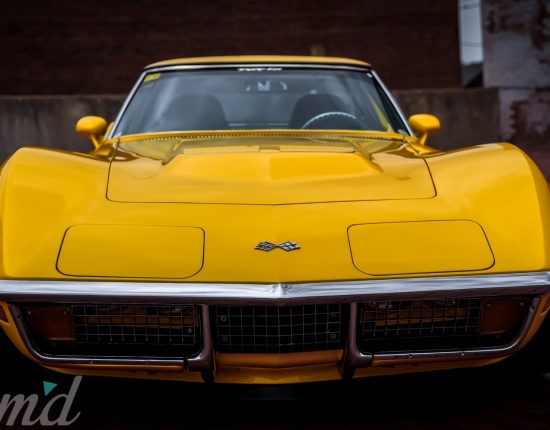 He was able to find a suitable small block Chevy, a Vortec 350, and completed the motor swap. 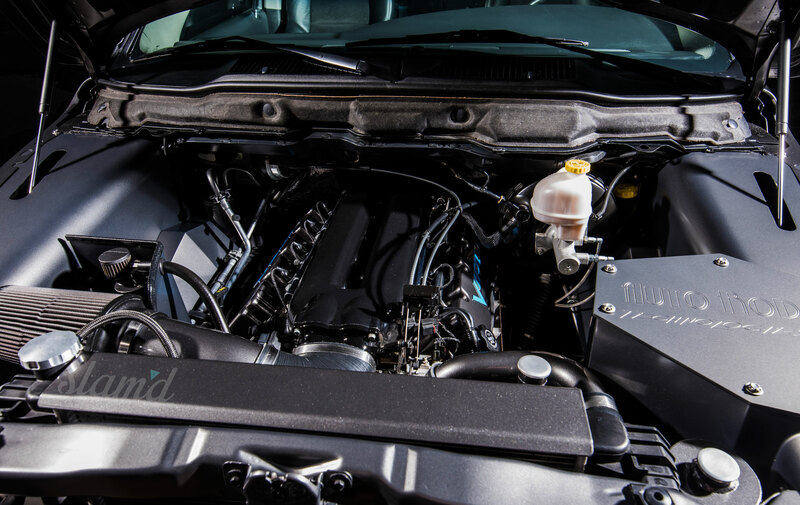 The potent engine is backed by a very stout 700R4 transmission and 10-bolt rear using a Detroit locker. The motor sounds fairly pissed-off rumbling through a set of custom-built headers and exhaust using Magnaflow mufflers. In order to spruce up the new home for the additional cylinders, Cory painted the firewall and inner fenders with matching graphics to compliment the Blazer’s exterior. At this point, Cory had what he had originally envisioned for his blazer. It had the freshened (a vast understatement) paint, and the V8 made for stylish, reliable drivability. 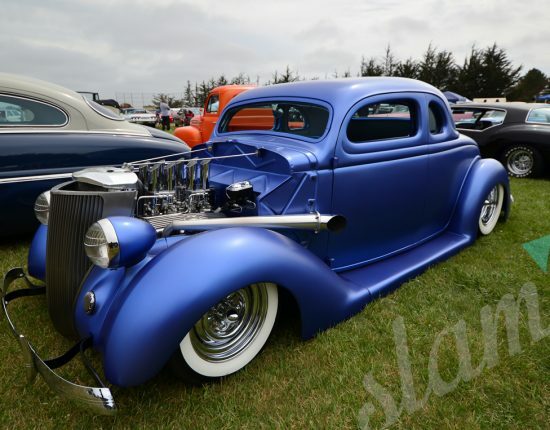 He did not however have the ultra-custom, hand-built Street Rod build that he had intended. Having committed fully to the S10 now, it was only a matter of time before the serious work came about. That time was roughly one year post motor swap. It was then, that after having a good time and plenty of success in showing his blazer, Cory made the decision to bag and body drop the truck as well. Cory made his own frame table to begin the chassis work. After removing the whole body from the frame, he cut the frame just behind the control arm mounts. He then built an entirely new rear frame using 2×3 box steel and fabricated an entire new floor, firewall, inner fenders/tubs, and engine bay cover. 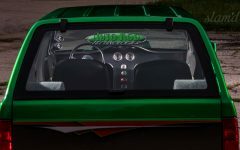 Capping off the sheet metal fabrication, a custom dash which flows into a custom center console was scratch-built. 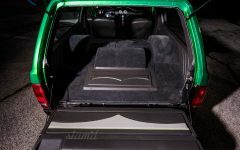 His suspension system built to couple with the new chassis and body, consists of Thorbecke Brothers tubular control arms with ‘bag cups also home to Air Lift Performance Dominator ‘bags. 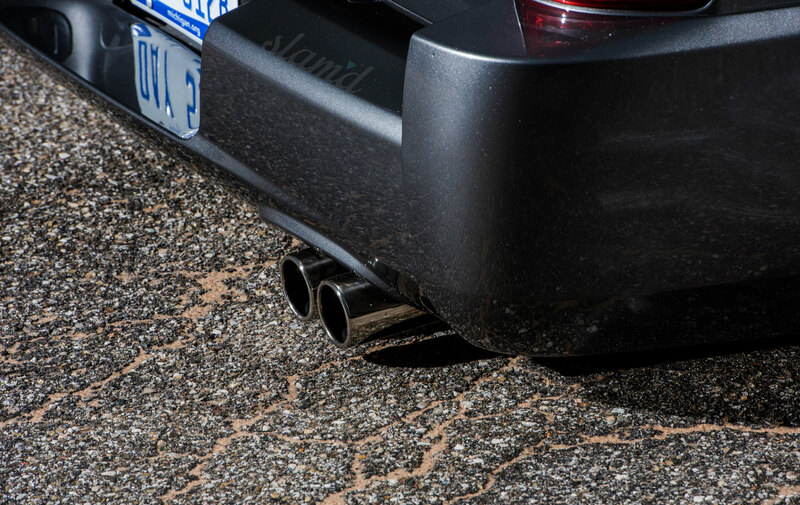 The rear similarly uses the Thorbekce and Air Lift combo, in a 3-link configuration, along with Nitro Drop Shocks. After the chassis and suspension work was completed, the sheetmetal was sealed, primed, and painted, along with the entire frame and suspension, all to match the exterior scheme. The paint extends from the body and frame to the engine, transmission, new control arms, links, and axle. The fully sorted and properly constructed air bag/body drop combination tucks Cory’s choice of wheels comfortably. 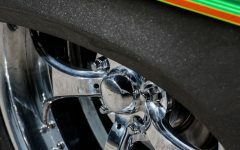 Providing rolling attire are Raceline wheels, measuring 20×8.5 inches. The wheels are paired with sticky Nitto Neo Gen 255/25/20 tires, which help apply the Vortec supplied torque. 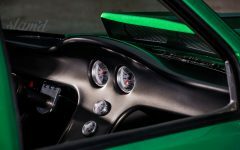 Slowing the Blazer down are disk brakes behind each wheel, managed by a Wilwood master cylinder and pedal assembly. To help further the modernization of some of his Blazer’s features, all the brake lines were replaced with stainless steel, as well as braided fuel lines running to an aluminum fuel cell. 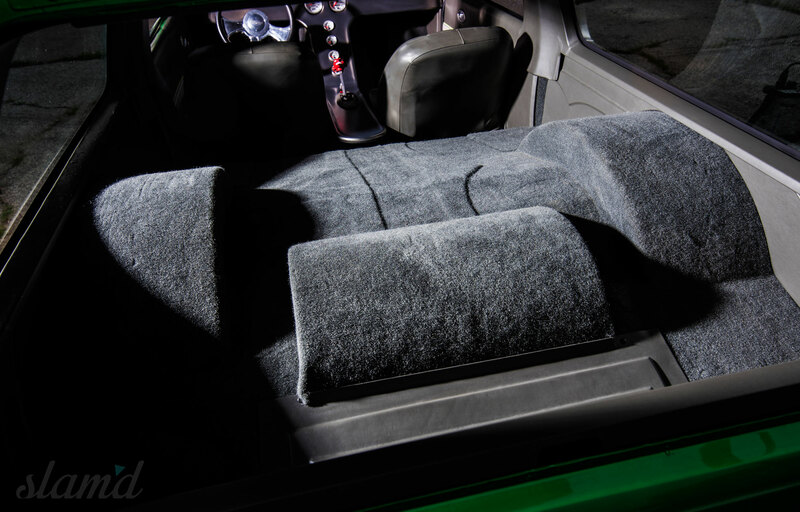 Ace Custom Upholstery was then tasked with creating a brand new interior from the floor up for Cory’s Blazer. 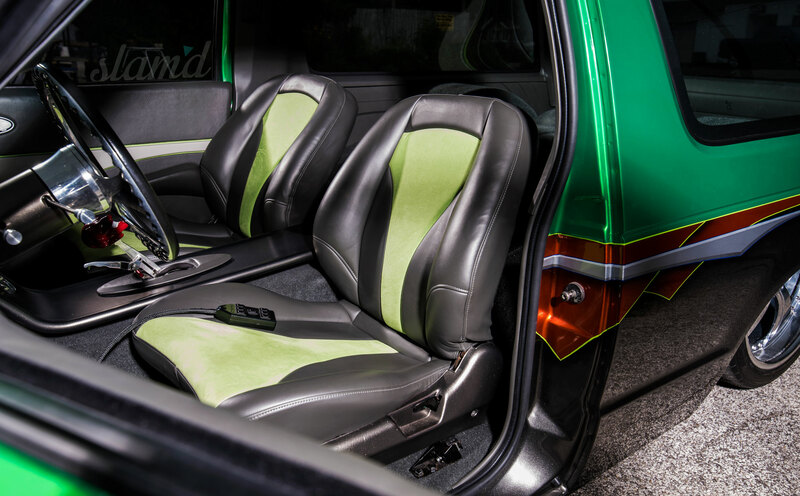 The new interior, including new buckets, was completed and the truck sent back to Cory, just one week before the Detroit Autorama. 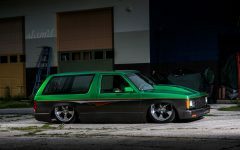 This was an ideally perfect show for Cory to debut his newly built and ‘bagged beauty. The last push to show readiness brought along its own challenges. Cory spent each late night accompanied with friends and family to try and sort out all the fine toothed details. 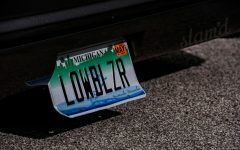 However, just two days after getting it back, the Blazer’s rearend failed, possibly thanks to his brother Chad and those rolling burnouts. The rush to repair and continue fine tuning was completed, and Cory not only took home first in his class but also scored the coveted “Rising Star” award. 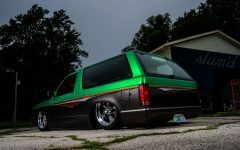 Cory’s S10 Blazer is a seriously beautiful truck. From top to bottom everything was done the long way and the right way. Gorgeous paint, ideal wheels, a polished interior, and perfect engine choice all add up to a fantastic build. However there is more to Cory’s custom; There’s a hard to define x-factor that makes it so special. Part of the magic to his story is that he had the Blazer for so long, all the while searching for a special, elusive candidate to dump his plans and passion toward. The fact that what ended up being the object of his obsessive search, was with him all along, is truly poetic satisfaction. It takes what would be in any context a worthy and superb example of a laid out SUV, but gives it that extra measure of soul and indefineability making it a truly beautiful Slam’d ride. Special Thanks: To Auto Rod Technologies for helping me out with this build from beginning to end, and letting me take up space in the shop while doing it, thanks to Ace Eckleberry of ACE custom upholstry for making me an awesome interior so quickly, thanks to all the friends and family that helped one way or another over the length of this build and especially thanks to my wife Desiree for putting up with all the late nights and weekends not at home.